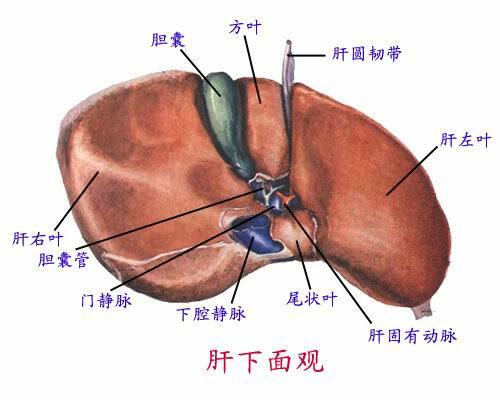 肝是最大的消化腺，呈楔形褐红色。 The liver is the largest digestive gland, red brown wedge. 以镰状韧带为界分为左、右两叶。 With sickle ligament for the sector is divided into left and right lobe. 有两纵一横沟，分为左叶、右叶、方叶和尾状叶。 There are two vertical and one horizontal groove, into the left lobe, the right lobe, side lobe and caudate lobe. (1)左纵沟：前为肝圆韧带，后为静脉韧带。 (1) The left vertical groove: Before the round ligament of the liver after intravenous ligament. (2)右纵沟：前为胆囊窝，后有下腔静脉通过。 (2) the right of the vertical groove: Before gallbladder fossa, after the inferior vena cava through. (3)横沟：又称肝门，是肝左右管、肝固有动脉、肝门静脉、神经、淋巴管等出入的部位。 (3) lateral grooves: also known as porta, liver around the tube, and out of the site of the hepatic artery, portal vein, nerve, lymphatic and so on. 肝大部位于右季肋区和腹上区，少部分位于左季肋区。 Most of the liver in the right upper abdomen quarter rib area and the area, a small part in the left quarter rib area. 与膈穹隆一致。 Consistent with the diaphragm dome. 右侧与右肋弓基本一致，剑突下可达3~5cm，平静呼吸时上下共有2~3cm的移动度。 Consistent with the right costal arch to the right, up to 3 ~ 5cm xiphoid, down a total of 2 ~ 3cm mobility during quiet breathing. (1)位置：胆囊位于右季肋区，肝的下方胆囊窝内。 (1) Location: Located right quarter rib area of the gallbladder, the gallbladder fossa beneath the liver. (2)形态分部：似梨形。 (2) Form Division: like a pear-shaped. 分为胆囊底、胆囊体、胆囊颈、胆囊管四部。 Into the bottom of the gallbladder, gallbladder body, the neck of the gallbladder, cystic duct four. 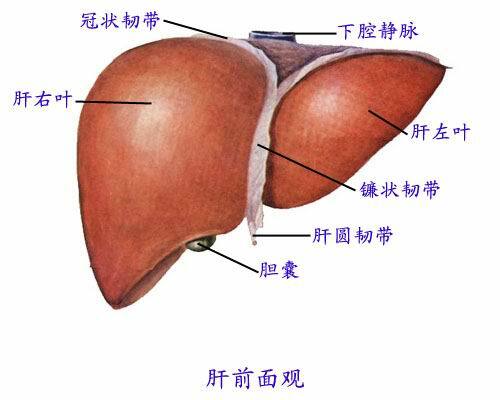 (3)主要功能：暂时储存和浓缩胆汁。 (3) The main function: to temporarily store and concentrate bile. (4)胆囊底的体表投影：右锁骨中线与右肋弓交点稍下方。 (4) the end of the surface projection of the gallbladder: right clavicular line and slightly below the right costal arch intersection. 是将胆汁输送至十二指肠的管道。 Is delivered to the duodenum of the bile duct. 胰位于胃的后方，相当于1、2腰椎水平。 Pancreas is located behind the stomach, the equivalent of 1,2 lumbar level. 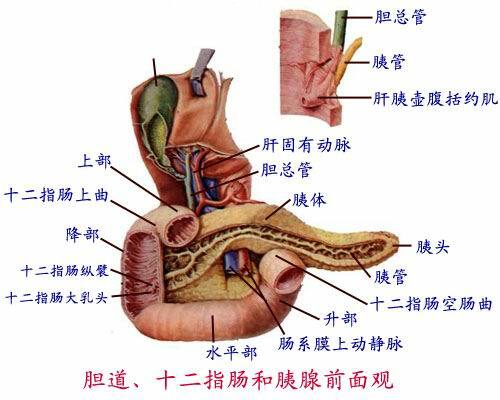 胰分三部：胰头、胰体、胰尾。 Pancreatic three points: the head of pancreas, pancreatic body and tail of the pancreas. 胰头被十二指肠环抱。 Pancreatic head surrounded by the duodenum. 分泌胰液，由胰管开口于十二指肠。 Pancreatic secretion by pancreatic duct opening in the duodenum. 分泌胰岛素，调节血糖。 Insulin secretion, regulation of blood sugar.